DUBLIN (CNS) — When the head of communications for an international Catholic charity visited Syria, it was not safe to go to Aleppo. So Sister Annie Demerjian, an Armenian religious sister from the city, traveled to visit him. Sister Demerjian and her community provide emergency support to Christians and others living in the bombed-out remains of Aleppo. 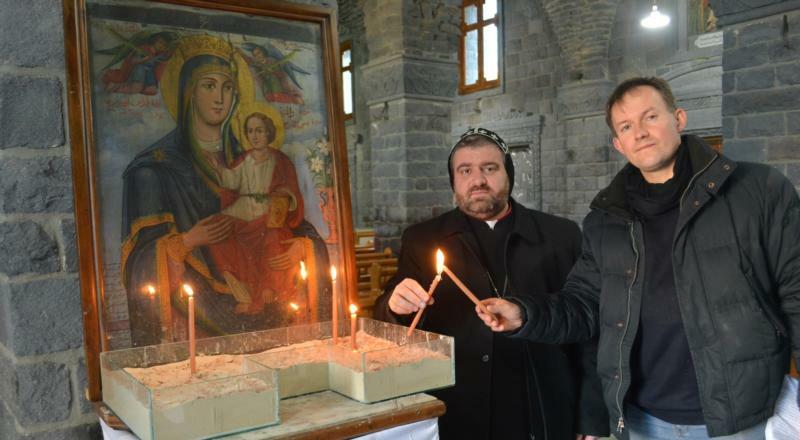 In February, Pontifex spend 10 days in Syria, visiting Homs, Maaloula and Damascus. In early April, he told Catholic News Service that the international community should follow the lead of the U.S. House of Representatives and U.S. Secretary of State John Kerry, along with the European Parliament, by “speaking up for those who are voiceless” and declaring what the Islamic State group is doing in Syria and Iraq as genocide before it is too late. Pontifex said the criteria for genocide under the U.N. Convention on Genocide had been met in Syria and Iraq and that “an appalling and despicable crime” was unfolding against Christians and other faith groups. “We do not want to wait to see the complete elimination of Christians, Yezidis and certain Muslim groups before we actually declare this violence for what it is because by that stage it will be too late,” he warned. In Homs, once home to Syria’s second-largest Christian community, Pontifex spent time with Syriac Orthodox Bishop Selwanos Alnemeh of Homs and Hama. The bishop’s own house in the old city of Homs has been destroyed, and he now lives on the outskirts of the city with thousands of other displaced Syrians. “He took us into Homs at risk to himself and at risk to us; he was determined for us to see for ourselves what is really going on. He took us around the remains of the bishop’s house which has been absolutely smashed to smithereens, and he took us into the ruins of his church, which had been built over an underground church dating back to 50 A.D. It is right in the heart of the old city. As he walked around the charred and shattered remains, he recalled coming there as an orphan and he said, ‘We are all orphans now.’ He meant it literally but also metaphorically, because he was thinking of the many thousands of people who have gathered on the edge of Homs,” Pontifex said. “We saw for ourselves the remarkable work that he is doing in providing aid to those who have lost everything and who have come to him with nothing,” he added. In Syria, Pontifex said, he saw churches that had been desecrated by Islamic State as well as people driven from their homes because they would not convert or pay the “jizya” tax. He said minority persecution includes assassinations of church leaders, mass murders and deportations, torture, kidnapping for ransom, forcible conversions to Islam. “We also have evidence of bishops, priests and other faith leaders being specifically targeted, kidnapped or killed,” he said.